Founded in 1670 and cradled in the heart of Kenmare Bay, Kenmare has been titled Kerry’s first Heritage Town. Its breathtaking scenery and unique charm make it a worthwhile stop while in the Killarney area. For the traveler willing to take a longer look, Kenmare abounds with archeological sites. Set among the artisan shops and spectacular views are ancient roots, for this town has one of the largest stone circles in the south-west of Ireland, and it is also the only monument of it’s kind to be situated so close to a town. 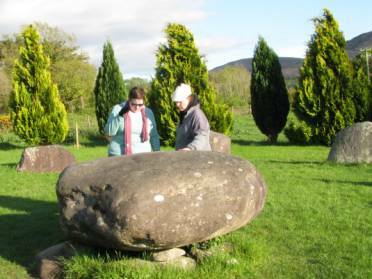 The pamphlet we obtained from the Kenmare Stone Circle tells us that “the Cork/Kerry Stone circles may have some relationship with the famous monument at Stonehenge”, and that in the center of the circle is a type of burial monument known as a “Boulder Dolman” which are rarely found outside of Southwestern Ireland. This monument shows occupation in the area going back to the Bronze Age (2,200-500 B.C), when it was constructed. The circle has 15 stones that are made of greenstone or brownstone and form a large egg-shaped circle with a boulder dolmen in the center. This is an impressive boulder-burial with a giant capstone that weighs almost seven tons. Stones of this type are not found for many miles and were undoubtedly moved to this location. It is unclear as to what the meaning of this monument is. It may have been used for rituals by druid priests, hence the local name “Druids Stone Circle”. It may also have been used as a primitive calendar, or a burial site, beneath the center stone. Stone circles were built during the Bronze Age for ritual and ceremonial purposes. Some studies have indicated that they were orientated on certain solar and lunar events, such as the position of the sun on the horizon on a solstice. Visitors to the Druid Stone Circle conducting a ceremony. 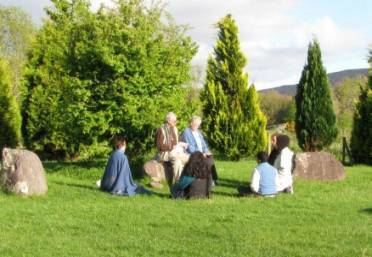 When we arrived at the Stone Circle, we found another group holding a ceremony there. We stayed in the background observing their ritual, quietly lending our own energy to it. As you look around the landscape you’ll notice that a grove of trees surrounds it, giving it a sense of privacy, even though it remains a scarce few feet from the modern world. 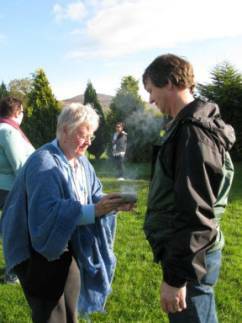 As they finished, the woman who was leading the ceremony came over to us and offered a blessing and a smudging. Moved by the kindness we gratefully accepted. It seemed a shame to break the silence and inquire where they were from, so we shared in the beauty of the moment. It was only a few days ago that I realized who this lovely woman was, certainly serendipity connected us and I was able to thank her for her gesture of welcome and the blessings that came with it. Inside this circle, one would find a very massive center stone, which we gathered was used for an altar stone. A ritual had just been held there, and in that spot, I felt a source of energy. Very interesting. The energy didn’t seem at all alarmed that we were there. Perhaps it was not even aware of it. Perhaps it was on its own plane of existence. 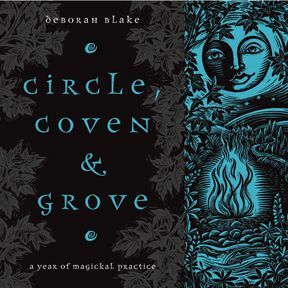 Stepping into that circle was like stepping back into time if one opened their minds and closed their ears and eyes. On Friday morning we visited another stone circle just outside of Kenmare. This one seemed powerful to me, perhaps because the stones, taller and broader than the ones at the lake, stood like the ghosts of the people who once worshipped there. I breathed deeply as I stepped through the invisible boundary. These stone circles date to around 2500BC, well before the time of the Druids, though the two have become linked in our minds. We know that the Druids performed ritual sacrifice, but we have no idea about the Neolithic people of 4500 years ago. Nonetheless, it was disconcerting to see the large, flat boulder smack in the center of the circle. Maybe for sacrifice, maybe not, but it still gave me the chills. Highly recommended place to stop if you are visiting the Killarney area of Ireland. Just a short walk up the hill from Market Street you will find Kenmare Stone Circle, just follow the signs on the left side of the road. There is a small structure at the entrance where you can get information about the site; there is a sign that asks for a small donation.